Attracting and retaining top talent is no easy task. But what if you had top talent knocking on YOUR door (rather than the other way around)? In today’s competitive job market, focusing on your employer brand will help you stand out from the competition and set yourself apart from others. While company branding may not at first seem like a form of marketing, it definitely is. In fact, the best companies in the world know the importance of investing in employer branding to land top talent and create a solid work environment. If you’re looking to make your employer brand awesome this year, then read on to discover six employer branding best practices (complete with inspirational examples!). There’s a reason why companies have become more and more transparent over the years by blogging: It works! Blogging about your company culture can give job candidates a closer look into your company — not to mention it’ll give them a FAR better idea about what it’s like working for your company than a business card ever could. In your careers blog, you can talk about anything from new hires to upcoming programs and initiatives. Chat with your employees and highlight their thoughts. Paint a picture. Take a company like Buffer, for example. They’ve built a legendary company blog that gives people an inside look into the way they run and manage their company. Buffer definitely doesn’t hold back, either. They share just about everything related to what it’s like working for a growing company. 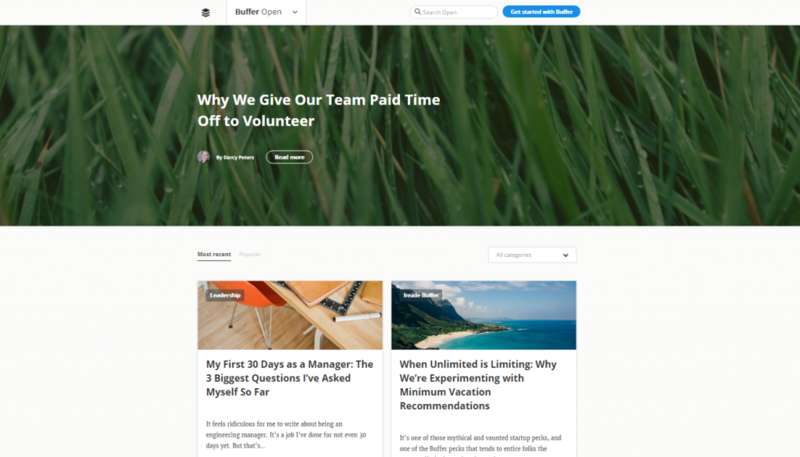 In fact, Buffer’s blog has impacted so many people that it has received THOUSANDS of social shares. Just think about how many potential job candidates you could get in front of by blogging about your company on a regular basis. I know what you’re probably thinking: Great, another thing to add to my busy list of things to do. But here’s the thing: You don’t have to do it all. You can get your whole staff involved, and even reach out to other departments in your company to contribute. It’s completely doable if you reach out to others in your company and ask them to get involved, and you can get started as soon as next week using a CMS like WordPress. Alright, so another prime example of great employer branding that I really want to mention is none other than Yelp. Yelp even has an entire careers section on their blog devoted to highlighting employee stories, programs, and other activities. Bottom line: Start blogging about what it’s like working for your company by creating a “Careers” blog. Ask others in your company to contribute to this blog regularly. You can get started right away by installing WordPress onto your website. When it comes to building a company careers page, it’s all about your approach. Sure, you could throw up a page in an hour or so and hope for the best — OR you could treat it as a long-term project and invest your time and passion into it. Rather than view it as a task, think of creating your careers page as a craft and get your whole team onboard. It’s also good to take some time to think about what candidates are looking for and design the page with them specifically in mind. In other words, ask yourself: What’s in it for them? 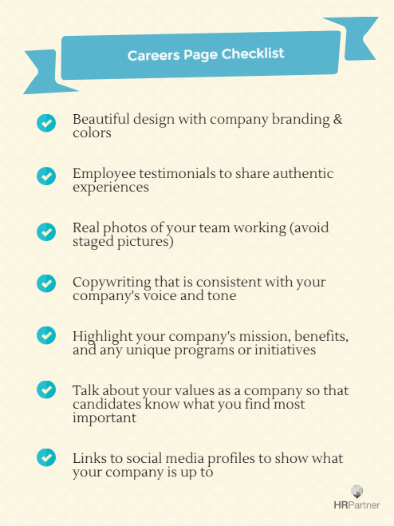 Don’t be afraid to elaborate and let them know what working at a company like yours would mean for them. How is your company different? Let them know right there on the page. Take the Starbucks careers page, for example — notice that they do a great job of pointing out what they offer to employees right away. They talk about their college tuition coverage and support for military families. Another brilliant example would be Hubspot’s careers pages. You read that right: I said “pages” — as in, they have separate pages for each department to make it super personalized. Just look at HubSpot’s dedicated page for the People Operations team (picture below). It shows what it’s like working in this specific department, introduces the team, and it’s fun. These pages show candidates what it’s really like working at HubSpot (and in more way than one). The cool thing about this page is that while it represents the company extremely well on a professional level, HubSpot also keeps it casual by talking about the team’s interests outside of work. This personal approach humanizes the page — AND the company. Bottom line: Create a “Careers” page that features genuine testimonials and stories from current employees. Highlight the benefits of working for your company from the perspective of an employee. Videos are often overlooked when it comes to employer branding, but it’s a great tool to have in your toolkit when recruiting top talent. Their videos (like the one below) offer a glimpse into life at Microsoft. -Create a video about what it’s like working for your company. Interview employees and ask them what they love most. -Feature footage of different teams working and hanging out at events. -Consider creating separate videos for each department for a more personalized experience. Bottom line: Creating personalized videos will help you reach a larger pool of job candidates. Don’t be afraid to show your company’s personality. When you think of company handbooks, what comes to mind? You probably remember all the times you’ve had to read through a tedious company manual or handbook. And — let’s be honest — not all of them were likely very entertaining or memorable. Which is why I’m going to share an example of an AWESOME employee handbook. In fact, it left such a great impression on so many people that it went viral. 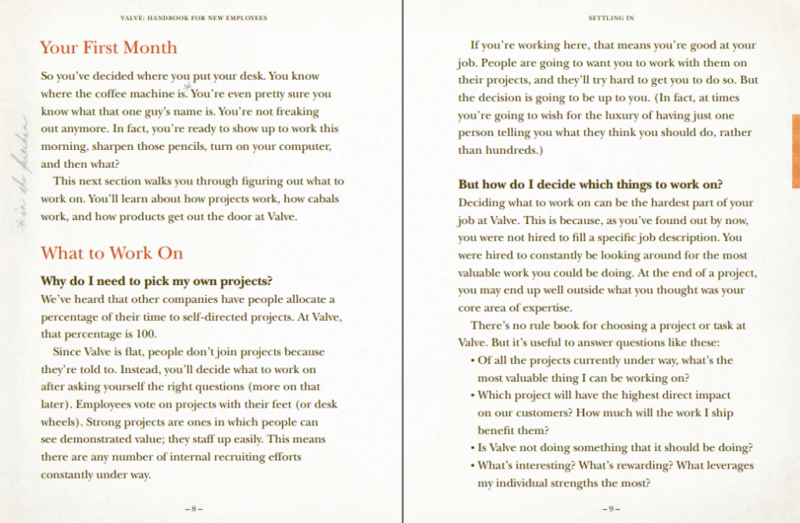 I’m talking about the Valve employee handbook. This handbook is a perfect employer branding example with its unique combination of humor and empathy. Put simply, it’s very relatable. [The Valve employee handbook]The other thing is that they managed to include many useful examples in their handbook. Rather than rambling on about a policy (with no context), they would instead talk about specific examples. And that’s something to keep in mind: Including specific examples will make any handbook much more useful. But more than anything, a handbook with personality and authenticity goes a long way in welcoming new employees to your company. Bottom line: To create an employee handbook that resonates, don’t be afraid to give it personality. When going over policies, be sure to include examples to make things easier. Your brand already uses social media for marketing, so why not use it in a slightly different way? I’m talking about using social media to represent the day-to-day in your company and to get in front of the right candidates. According to a survey by CareerArc, a whopping 62% of job seekers scope out a company’s social media accounts before deciding to apply for a job. So you can see why it’s especially important that you tap into this. To do this, consider creating separate social media accounts specifically dedicated to careers at your company. You could call these new social accounts something like “[YourCompanyName] Careers” — or, if you’re a larger company, you could even take it a step further by creating separate social accounts for each department. 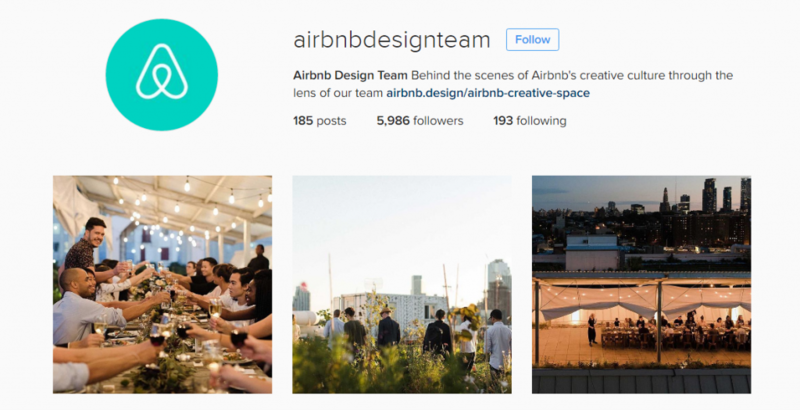 Not only does Airbnb’s design team have a strong presence on Instagram, but this page also offers a beautiful look at the company on a more personal level. It goes beyond just words — candidates get a visual representation of what it’s like working at the company. Bottom line: Engage future recruits by creating social media accounts dedicated to careers at your company. Post behind-the-scenes pictures. You can even build out separate social accounts for each department to make it even more personalized. It might sound cheesy, but the truth is that the key to building a strong employer brand really comes down to working together to make it happen. According to a survey by Career Arc, nearly half of employers think they don’t have the necessary tools they need to build a great employer brand. I get it: It sounds daunting, and it’s definitely not something that can be done overnight. But here’s the thing: You already have all the tools and resources you need. You have your team. It’s the people in your company that ultimately fuel your employment brand. The more you involve the people that make up your company, the more memorable and awesome your employer brand will be. And that’s what every company is powered by, after all: Its people. So, go out there and build something unforgettable! How about you? Planning on doing something to enhance your employer brand this year? Share with us below in the comments.